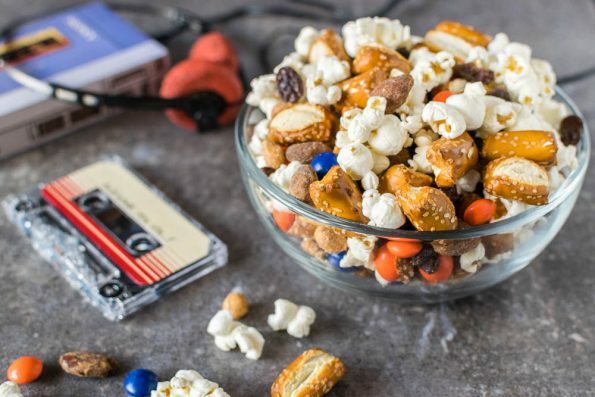 This Awesome Mix Recipe is a Paid Promotion for Guardians of the Galaxy Vol. 2. After coming up with the recipe for our Groot Bark, we were asked to create a second recipe for Marvel’s Guardians of the Galaxy Vol. 2. With our first recipe inspiration coming from a character in the film, we decided that the second should come from elsewhere. Then it dawned on us, the soundtrack! 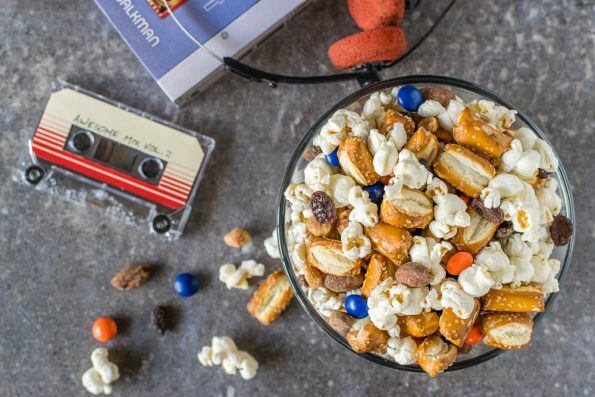 Thus, Awesome Mix Trail Mix was born! The Awesome Mix Vol. 2 contains classics from artists such as Fleetwood Mac, ELO, and Cat Stevens. With the soundtrack being so important to both movies both from a setting and story telling standpoint, we felt it was important to pay tribute to that. Just look at the opening scene using Mr. Blue Sky by ELO, it not only lends itself to letting the adorable Baby Groot dance around but also mirrors Quill’s dance number from the first movie. The use of music in both films does an excellent job of adding additional story telling elements to the movies. When coming up with the ingredients for our Awesome Mix Trail Mix, we wanted to add things that we of course thought were awesome. We started with popcorn because obviously when you watch a movie you want to eat popcorn. At least we do anyway. Next we added the honey roasted peanuts and almonds to sort of tie it to our Groot Bark recipe. The candy coated chocolate pieces are added for a bit of color. The rest can actually be switched out to your flavor preferences. After all, why not get inspired to create your own Awesome Mix? We hope you’ve enjoyed our recipes for Guardians of the Galaxy Vol. 2! What would be your ideal Awesome Mix? Leave your comments below or tag us using the hash tag #GeekEats! Don’t forget that Guardians of the Galaxy Vol. 2 is now available on Digital HD and Blu-ray! Toss gently so as to not crush popcorn.